Coordinating our use of the earth's natural resources is not easy. Resource users are many, their goals diverse, and their impacts on the environment often uncertain. How we use those resources depends on the signals and incentives we receive, from either the market or our governments. These systems encourage certain uses of natural resources, but they are not perfect. We harm the environment not out of malice, but because we do not know the consequences of our actions, or the incentives for harm are too great to ignore. * the uncertainty and complexity of environmental issues: climate change, water rights, air pollution and overharvesting of common resources. 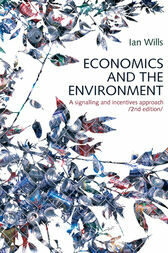 This second edition of Economics and the Environment is fully updated and includes new material on sustainability, valuation of environmental changes, the prospects for international cooperation under the Kyoto Protocol and the problems of defining and enforcing measures to protect biodiversity. It offers students in both economics and environmental studies programs a coherent framework for understanding our major environmental problems.